Welcome to the October 2014 newsletter! This october, among all the items displayed, we are proud to feature two beautiful books about abandoned and desolated landscapes: Abandoned by Eric Holubow and Dust by Nadav Kander. Craft beer becoming really trendy all over the world, and particularly in Paris, we enclosed to books on it. As usual, you will find two articles by our contributor Olivier Namias. 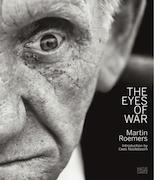 Our backlist book is be The Eyes of War by German photographer Martin Roemers whose work is exhibited in Berlin until January 4, 2015. Urban exploration photography by Eric Holubow. PDF of the article by Olivier Namias dedicated to French photographer Bertrand Stofleth. Monograph dedicated to New York's graffiti artist Blade. Photographs of disused nuclear military aeras in former USSR by Nadav Kander. A really clear and explicative guide to make your own beer. The initiatory journey of young French architects in the 70's U.S.A.
Catalogue of the contemporary art exhibition at the prison Sainte-Anne, Avignon. Comprehensive overview and a practical approach of this centuries-old drink. Forty portraits of blind war victims by photographer Martin Roemers. Copyright © urban-resources.net - October 2014 - All rights reserved.